Anne of the Island is the third book in the Anne of Green Gables series. New adventures lie ahead as Anne Shirley packs her bags, waves good-bye to childhood, and heads for Redmond College. With old friend Prissy Grant waiting in the bustling city of Kingsport and new pal Philippa Gordon at her side, Anne tucks her memories of rural Avonlea away and discovers life on her own terms. "Harvest is ended and summer is gone," quoted Anne Shirley, gazing across the shorn fields dreamily. She and Diana Barry had been picking apples in the Green Gables orchard, but were now resting from their labors in a sunny corner, where airy fleets of thistledown drifted by on the wings of a wind that was still summer-sweet with the incense of ferns in the Haunted Wood. "It has been a nice summer," said Diana, twisting the new ring on her left hand with a smile. "And Miss Lavendar's wedding seemed to come as a sort of crown to it. I suppose Mr. and Mrs. Irving are on the Pacific coast now." "It seems to me they have been gone long enough to go around the world," sighed Anne. "I can't believe it is only a week since they were married. Everything has changed. Miss Lavendar and Mr. and Mrs. Allan gone—how lonely the manse looks with the shutters all closed! I went past it last night, and it made me feel as if everybody in it had died." "We'll never get another minister as nice as Mr. Allan," said Diana, with gloomy conviction. "I suppose we'll have all kinds of supplies this winter, and half the Sundays no preaching at all. And you and Gilbert gone—it will be awfully dull." 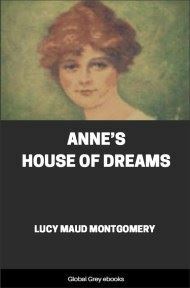 "Fred will be here," insinuated Anne slyly. "When is Mrs. Lynde going to move up?" asked Diana, as if she had not heard Anne's remark. "Tomorrow. I'm glad she's coming—but it will be another change. Marilla and I cleared everything out of the spare room yesterday. Do you know, I hated to do it? Of course, it was silly—but it did seem as if we were committing sacrilege. That old spare room has always seemed like a shrine to me. When I was a child I thought it the most wonderful apartment in the world. You remember what a consuming desire I had to sleep in a spare room bed—but not the Green Gables spare room. Oh, no, never there! It would have been too terrible—I couldn't have slept a wink from awe. I never WALKED through that room when Marilla sent me in on an errand—no, indeed, I tiptoed through it and held my breath, as if I were in church, and felt relieved when I got out of it. The pictures of George Whitefield and the Duke of Wellington hung there, one on each side of the mirror, and frowned so sternly at me all the time I was in, especially if I dared peep in the mirror, which was the only one in the house that didn't twist my face a little. I always wondered how Marilla dared houseclean that room. And now it's not only cleaned but stripped bare. George Whitefield and the Duke have been relegated to the upstairs hall. 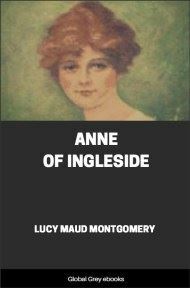 'So passes the glory of this world,'" concluded Anne, with a laugh in which there was a little note of regret. It is never pleasant to have our old shrines desecrated, even when we have outgrown them. "I'll be so lonesome when you go," moaned Diana for the hundredth time. "And to think you go next week!" "But we're together still," said Anne cheerily. "We mustn't let next week rob us of this week's joy. I hate the thought of going myself—home and I are such good friends. Talk of being lonesome! It's I who should groan. YOU'LL be here with any number of your old friends—AND Fred! While I shall be alone among strangers, not knowing a soul!" "EXCEPT Gilbert—AND Charlie Sloane," said Diana, imitating Anne's italics and slyness. "Charlie Sloane will be a great comfort, of course," agreed Anne sarcastically; whereupon both those irresponsible damsels laughed. Diana knew exactly what Anne thought of Charlie Sloane; but, despite sundry confidential talks, she did not know just what Anne thought of Gilbert Blythe. To be sure, Anne herself did not know that. "The boys may be boarding at the other end of Kingsport, for all I know," Anne went on. "I am glad I'm going to Redmond, and I am sure I shall like it after a while. But for the first few weeks I know I won't. I shan't even have the comfort of looking forward to the weekend visit home, as I had when I went to Queen's. Christmas will seem like a thousand years away."